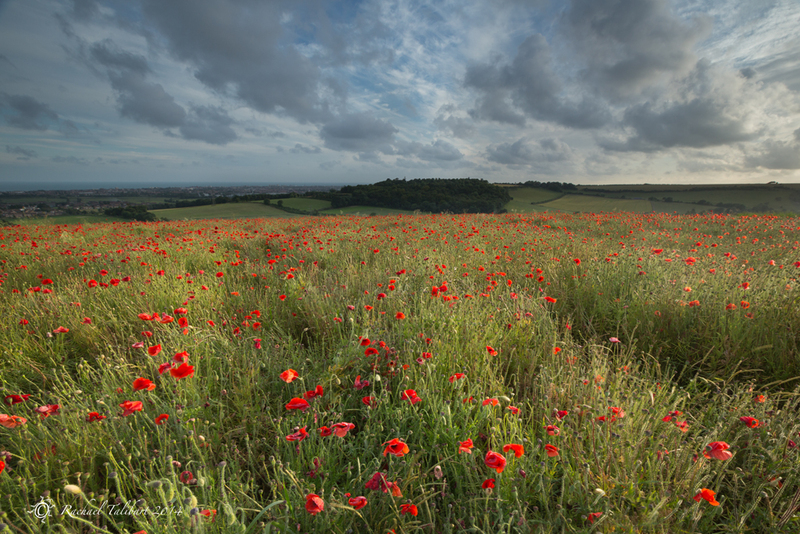 A week ago, I heard via my shooting buddy, Jen that there was a field of wild poppies on the South Downs, about an hour and a half away from here. The trip was more than rewarded. 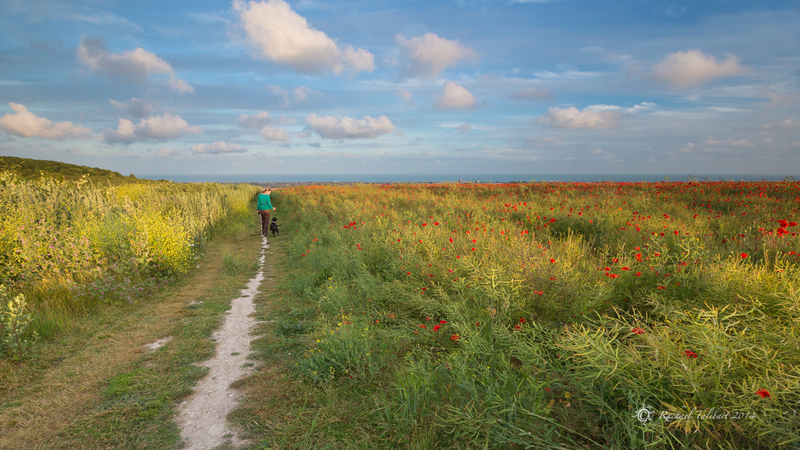 Perched high up on the South Downs overlooking the Solent, the poppies basked in the evening sun. We stood in that field for more than three hours and it felt like minutes. We have a few varieties of field poppies in this country. 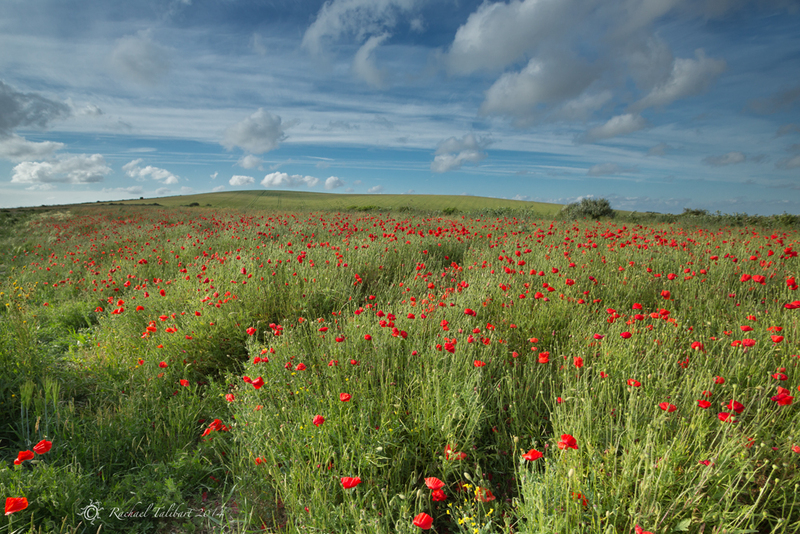 Poppy fields that spring up on fallow ground tend mostly to comprise the common poppy, papaver rheas. The prickly poppy, papaver argemone, has smaller flowers and prefers lighter, sandy soils. 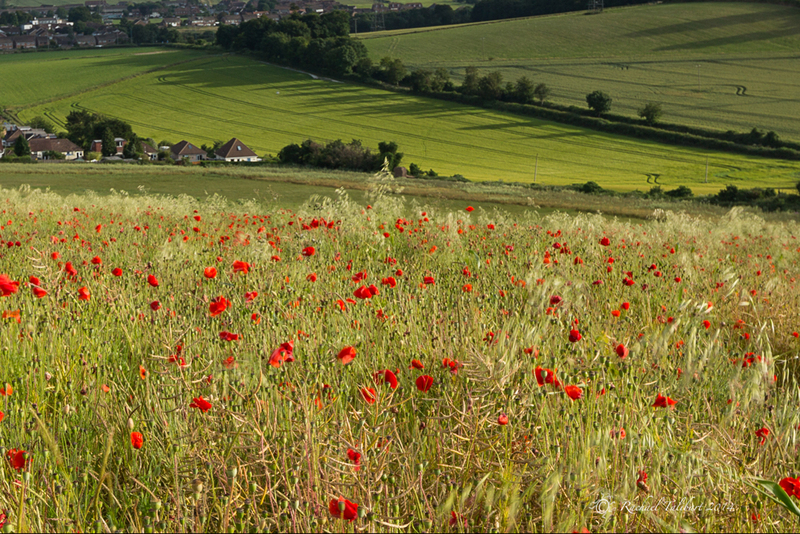 The rough poppy, papaver hybridum, is rarer, but its habitat is the chalky soils of the South Downs. I must confess that I didn’t inspect the individual flowers very closely but looking at my pictures, the poppies we stood among were mostly common poppies. An individual poppy flower lasts only one day but a single plant can produce as many as 400 flowers. That’s a lot of poppies. I would guess ‘our’ field was only about half way through its flowering life – there were plenty of seed heads but also plenty of buds yet to open. Another name for the common poppy is the corn rose. Ceres, the Roman goddess of corn was depicted wearing a wreath of common poppies. Poppies used to be a common sight in cornfields but selective herbicides and other modern farming practices have made this rarer. They do still pop up on land left fallow, but not in the same place two years running, which keeps landscape photographers on their toes! Of course, this year the poppy is very topical, with the WW1 centenary. These tough little plants, whose seeds needs rough handling to germinate, became the emblem of remembrance because they grew in such abundance on the disturbed soil of the battlefields. I must confess, however, that standing surrounded by the flowers as they nodded gently in the evening breeze, war and death couldn’t have been further from my mind. To see the poppies in the sun. But only money in his power. And danced for very ecstasy. 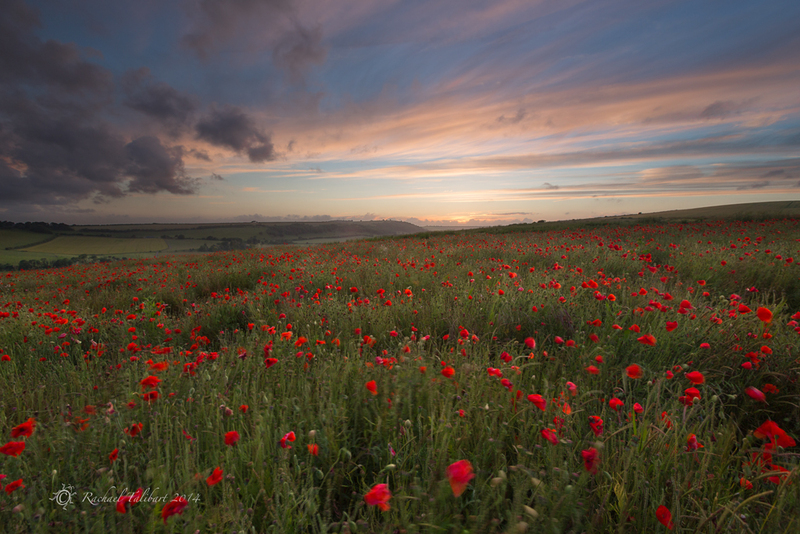 This entry was posted in agriculture, garden, nature, photography and tagged landscape photography, nature, photography, poppy, poppy field, South Downs, West Sussex, wildflower by Rachael. Bookmark the permalink. Beautiful and dreamy, Rachel. Have a fabulous day! Neat . . . I don’t think I’ve heard or seen of similar fields here. Thanks. They’ve become something of a holy grail for photographers, mostly because their locations are so hard to predict. Every summer there are rumours. Some photogs are happy to share their locations and some keep them close. Last year I found one quite by chance. It was indeed wonderful. It is perhaps a good thing that I don’t live any closer or my poor children would be going without dinner or washed clothes. California poppies (the same ones growing here in Oregon) used to cover entire fields out in the countryside, turning them golden orange. Such a lovely sight to see. Even more so when the purple lupines joined the poppies for a spectacular complimentary show of color! Hi. All three of the poppies mentioned here are red but we have other indigenous varieties that are different colours: for example, the yellow horned poppy, which grows by the sea. In my garden I grow Californian poppies. Love them. They self seed so freely. I also grow opium poppies, oriental poppies and welsh poppies. I have tried Himalayan poppies and Icelandic poppies too but my soil is wrong for them. Thanks! It was wonderful being there. Just love that first photo! It’s my favourite too. Thanks! Beautiful! Well worth the effort (in my opinion)! Where exactly is South Downs? Thanks. The South Downs are a range of hills in the south of England, mostly the countries of East and West Sussex (this field was in West Sussex). They are now a national park.